Here at PGF Caravan Services we carry out caravan refurbishment and repairs all around the Gloucester area, providing all our clients with a mobile service at your convenience. When considering refurbishing your caravan, there are many factors to consider, including which appliances you would like to replace or upgrade. You have many options available when refurbishing your caravan, as we offer upgrade services for your kitchen, worktops, electrics and much more. If you require caravan refurbishment in the Gloucester area, contact us at PGF Caravan Services today. A complete refurbishment can be a good investment to make, as you can replace and upgrade any parts that are worn, and potentially add value to your caravan. You can improve your caravan in a number of ways, including replacing your panels and walls. If facilities such as cupboards and cabinets within your caravan are damaged or worn, it can bring the overall aesthetic down. By refurbishing your caravan you can repair or replace all of these parts and personalise it to your preferred style. Take a look at some of our recent work here. Offering a mobile breakdown service to clients all around Gloucestershire, we can come to you at your location so there is no need to travel to us. Whether you are visiting Gloucester or live here, you can take full advantage of all our services including caravan refurbishment and taking care of any unexpected repairs you may need. If you are visiting the city of Gloucester and require our emergency caravan breakdown service, contact us today on 01452 553 288. Boasting the famous Gloucester cathedral and one of England’s most inland ports, Gloucester is a great place to visit with all the family as we are in driving distance of the Cotswolds and the Forest of Dean. If you prefer to stay in our lovely city, there are many facilities to take advantage of including the Hillfield Gardens and the Museum of Gloucester. Having renovated caravans from all the leading brands including Elddis, Lunar and Swift, our team are experts in the repair of all caravan parts including towing wiring and leisure batteries. When towing your caravan you must stick to the maximum noseweight, which is the maximum permitted weight of the load you are towing, which is different for each car. When planning your caravanning trip, you must ensure you have the correct towing mirrors that comply with legislation. Whether you choose caravan refurbishment or caravan servicing, there are a number of components we pay attention to. In order to make sure they are in full working order, we check the suspension, tyres and jockey wheel. With the ability to complete thorough checks to your caravan, we are fully equipped to also service your ventilation, gas regulator and water filtration system. When travelling outside Gloucestershire in your caravan you should check whether your tyres and brakes need replacing, as it is advised you replace your tyres every seven years, and we can provide a complete removal and replacement service. Specialists in inspecting your roofs, floors and grab handles, we can provide your caravan with comprehensive servicing to ensure its functionality and safety. 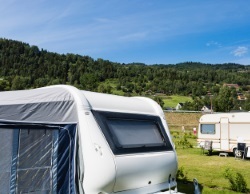 Having provided thorough caravan servicing throughout Gloucester for many years, we are able to offer the inspection of components such as your battery, the earth bonding and ensure all of the fire safety equipment is fully functional. The facilities of your caravan are a fundamental part of your caravan and will affect your stay, so ensuring they are fully functional helps ensure your stay has no disruptions. The renovation service we can carry out for your caravan comes with a damp testing service where we can easily spot any signs of humidity or damp and find the source of the problem. Although many people can spot the signs of damp by noticing black spots on your surfaces or a musty smell, we can provide a damp testing service that can prevent these things happening before these obvious signs appear. Mould and mildew could be a potential health risk to anyone staying in the caravan, so it is very important to have it checked regularly for damp issues. For caravan breakdown repairs and servicing when you need it in Gloucester, get in touch with PGF Caravan Services today for a fast, reliable service. Whether you require refurbishment, repair or need a wheel replacing, get in touch today.